Once you’ve done your homework and committed to self-publish, you’ll next want to decide the level of investment in time and money you’re willing to make. Your alternatives range from zero-cost—creating a Kindle and Smashwords ebook yourself—to expensive professional production of a print and ebook. In choosing how to self-publish, recall the point from part I of this series that “You don’t make money from a book; you make money because of a book.” If you keep in mind what financial benefits—direct and indirect—you expect from the book, it will help greatly in choosing whether to spend nothing, a little, or a lot on publishing. To get a good overview of the Kindle publishing process, read author Paul Jun’s The Ultimate Guide to Publishing Your eBook on Amazon’s Kindle Publishing Platform. While the money cost of do-it-yourself cover and interior design is little or nothing, you’ll expend considerable time to do it right. You have to be willing to learn the tools, and to spend the necessary time designing the cover and doing the layout. And unless you are a highly adept designer, it’s almost certain the result will not be as good as having a professional do the work. I could never have achieved the quality look for my novel’s ebook that my professional formatter did. Nevertheless, there is a place for do-it-yourself ebooks. If you are testing your ideas and your writing with a limited, friendly audience, a do-it-yourself approach can be appropriate. Also, if you don’t really expect much of a direct or indirect payback from your book, it makes more sense to do it yourself. However, in settling for a homemade product, remember that your Kindle and Smashwords ebook will be publicly available, and a poorly produced ebook can damage your brand. By spending in the hundreds of dollars, you can have your ebook professionally done, with a quality cover and layout. A professional-quality ebook is preferable if you want to preserve your brand, and you expect some benefit from your ebook. For example, it’s entirely possible to make money from an ebook, with no print counterpart. Indeed, a recent reader survey by the publisher O’Reilly found that print books are still the major format. The survey of 500 readers found that 40 percent still buy print books, while 26 percent buy ebooks, and 37 percent buy both. The next point along the self-publishing spectrum is producing a do-it- yourself print book, along with your ebook. As with do-it-yourself ebooks, the advantage is that for no significant publishing fee you can produce a print book through the print on demand companies Createspace, Lightning Source, or through Ingram’s new self-publishing service IngramSpark. Ingram is the largest wholesaler in North America and owner of LightningSource, and IngramSpark is aimed at giving self-publishers an easier route to using LightningSource. However, as with do-it-yourself ebooks, the disadvantage is that your print book will not present the same quality as a professionally produced book. Indeed, Guy Kawasaki, author of APE (Author, Publisher, Entrepreneur) How to Publish a Book in this article on mistakes self-publishers make lists a key error as designing your own cover. That said, if you are determined to create your own book cover, the ebook Do It Yourself: Book Covers, mentioned above, looks to be a good guide. So, for a cost in the thousands of dollars, you can commission a professional print and ebook cover and interior design and layout. Such a considerable investment makes sense if you plan to publish more than one novel, or if the market for your nonfiction book is significant. And, it makes sense if your book will be a significant part of your professional brand. This article by author services provider Miral Sattar, “The Real Costs of Self-Publishing a Book,” illustrates the range of potential costs for a professionally published book. And while it is generally accurate, you should read the comments following the article to get a sense of the sometimes contentious issues involved in pricing publishing services. Don’t try to save money by going to a so-called “print-on-demand publisher.” They typically promise that for only hundreds of dollars, you can self-publish a quality book. However, in book design, as with just about everything else, you get what you pay for. Such books are more likely to look amateurish, in both their covers and their interiors. Many of these publishers — for example, Arbor Books, AuthorHouse, iUniverse, and PublishAmerica — are notorious for producing lower-quality books and/or gouging authors. All of them make their money charging authors, rather than selling books. True, some are quite adequate if you plan to publish a book for family and friends. However in any case, before you get into bed with any of these companies, read The Fine Print of Self Publishing, which offers an independent assessment of the publishers and their costs. 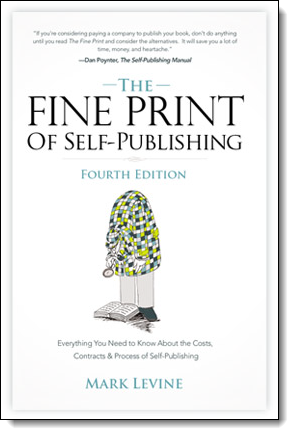 The book also includes an excellent primer on self-publishing. To get a sense of their tactics, see this blog post on the class action lawsuit against Author Solutions, the parent company of AuthorHouse, iUniverse, and many other POD publishers. There are, however, many reputable design firms that can produce a quality product. I used 1106Design to design the cover and interior layout and do the ebook formatting for my novels. Here’s the Independent Book Publishers Association list of book designers. and a list of recommended designers by self-publishing guru Dan Poynter. For print-on-demand production, I’ve used both Lightning Source and Createspace. The former is less author-friendly and requires that you be listed as a publisher, rather than an author. Thus, it provides little hand-holding. In contrast I found Createspace to be a responsive, author-friendly publisher that automatically lists my books on Amazon, which owns it. While publishing on Createspace is free if you provide your cover and layout, they also sell design and other services. However, in his book Levine ranks Createspace as only “pretty good,” while others, such as BookLocker and Infinity Publishing are listed as “outstanding.”Createspace’s services were also criticized on the Yahoo self-publishing group as being unresponsive because—probably like those of other POD publishers—they are outsourced to anonymous designers, not allowing the author the opportunity to choose his/her own designer, or to work with the designer directly. Regardless of how you self-publish, you should strive to make your copy as perfect as it can possibly be. This means quality copy-editing and obsessive proofreading over and over and over until you are totally sick of looking at your book. Then proof it again. Even the most trivial errors damage the credibility of your non-fiction book, and for novels pull readers right out of the story you’re trying to tell. One such thorough editing and proofing approach is detailed in this blog post by author K.M. Weiland. Having a professional proofreader doesn’t let you off the hook. For my novels, our proofreader found a great many errors that we missed. But we found many errors that she missed. And the proofing needs to be done over and over. We typically go through about nine drafts of each novel, and we still catch nagging errors even in the last proof. 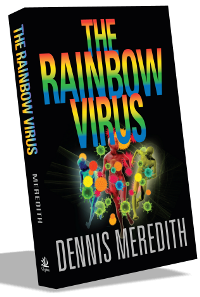 The classic case was my discovery of the backwards phrase “she drew lungs into her air,” in a late proof of The Rainbow Virus. Also, even a professional copy editor may miss higher-level conceptual or structural errors in your book. It’s also important to proofread all the way from the draft to the printed proof copy. We tried to submit the most perfect Word file possible to the designer. Even then, we found errors in the layout and still more in the proof copy. New errors just seemed to jump out at each step along the way. And they were high-level errors. As late as the proof copy, we found dialog that didn’t make sense and errors of logic and continuity that we hadn’t seen before. So, now that you’ve decided how to publish, your next challenge will be mastering the machinery that turns your book from manuscript into an officially published book. That seemingly daunting process is the subject of the next installment.